After I got back from my trip to San Diego I came down with the flu. Several of my coworkers on the trip had been sick recently, and I don't know whether I caught it from one of them or from someone on my flight. Either way, it knocked me out pretty good for a couple of weeks, and my wife ended up getting it too. After a couple of weeks of being cooped up indoors we were starting to feel a little better and itching to get out of the house. We took a short drive just before sunset on a road that heads through the foothills east of Boise. 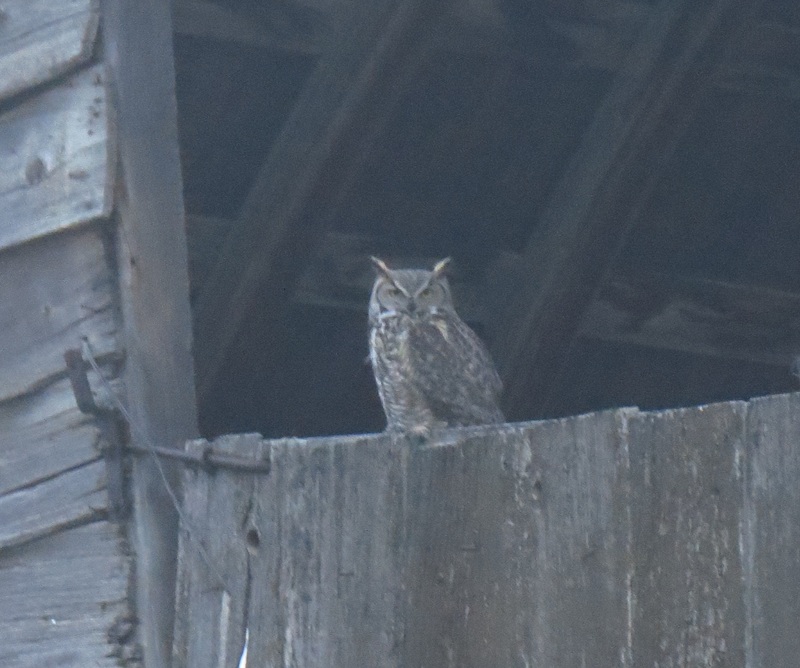 Right as the sun started to set we spotted a Great Horned Owl perched on an old barn near a creek. 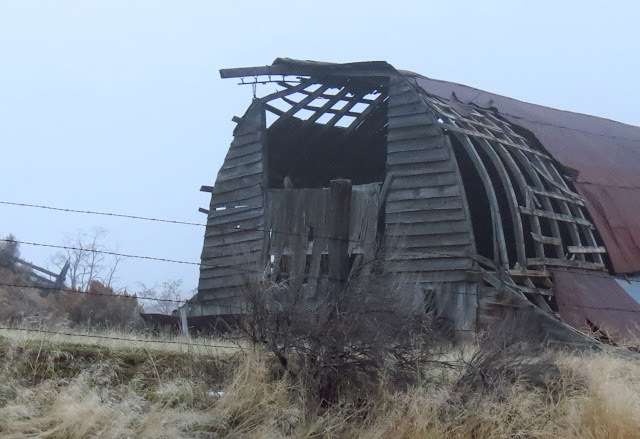 Old barn on Blacks Creek Road east of Boise. Can you spot the Great Horned Owl? February 3, 2013. With the fog hanging in the air and the sun setting, it was a picture perfect moment to find an owl. The owl is a little more apparent in this next photo. Great Horned Owl. 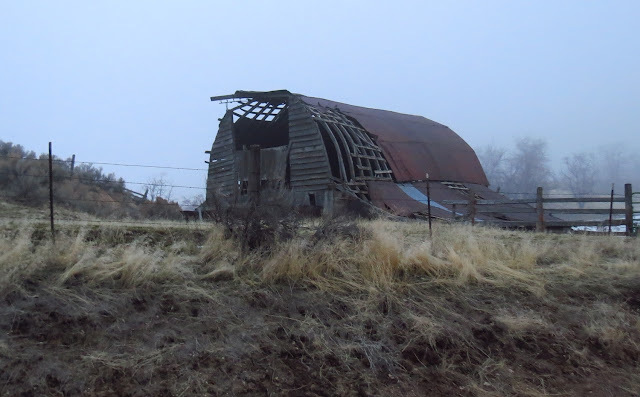 Old barn on Blacks Creek Road east of Boise. February 3, 2013. For the first minute or so he stared us down as we photographed him from inside our car. We're pushing our camera to the limits at this point, with the daylight quickly fading away, using our full zoom capability, and maxing out the ISO in hopes of getting a reasonable shutter speed. The owl didn't take long to stop worrying about us, and start looking for dinner. 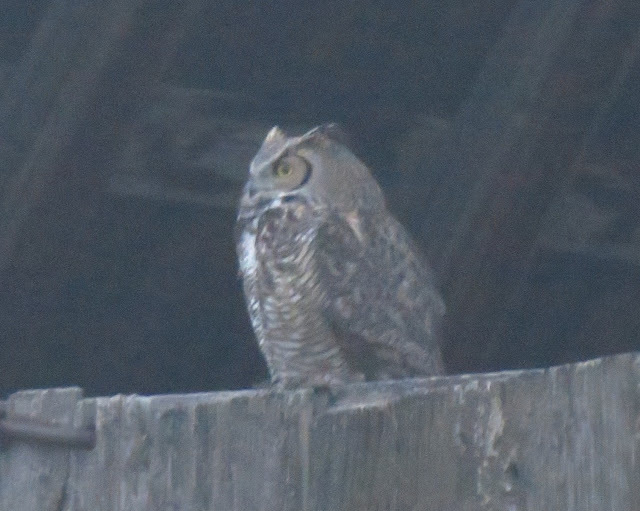 So far this year Great Horned Owls have been quite easy to find around Boise. Even so, the excitement of finding one never seems to fade.